Surround sound isn't quite de facto yet, but it's certainly more affordable than it used to be. Even if you don't want to invest in a "true" surround system, many headphones and soundbars can now get you close enough. The Z606 is probably one of the least expensive 5.1 options on the market. It's just $129.99, less than many individual speakers, yet it comes with a remote, Bluetooth 4.2, and on-sub controls with a simple LED display. You can connect any 3.5mm or RCA device, though in the latter case you'll have to supply your own cables. There are a few ways it reaches such a low pricetag. First the system is rated at 160 watts of peak power, or 80 watts RMS. That's weak when you consider that Logi's own Z906 has specs of 1000 watts and 500 watts respectively, albeit for $399.99. The Z606 is also completely wired apart from Bluetooth compatibility. That means you'll be stringing unsightly wires around, though Logi was smart enough to use 20.3-foot cables for the two rear channels, meaning you (probably) won't need any extensions to reach the back of a room. We'll have more to say later, but for now we'll say that initial tests were underwhelming. We had to crank the volume to hear much of the surround effect, even after using software to boost decibel levels and correct room dimensions. Audio fidelity was merely acceptable — with both 3.5mm and Bluetooth we occasionally heard distortion on the high end, and the subwoofer could stand to deliver more punch, which may not be surprising since it's capped at 50 hertz and 50 watts. There were a few moments of genius, such as when we tried a couple of tracks from Pink Floyd's remastered "The Wall" on Spotify's high-quality setting. For whatever reason, that version of the album easily filled the room with ear-pleasing sound, moreso than some of the other 5.1-enabled audio we tried. Stay tuned to AppleInsider for a full review in the near future. 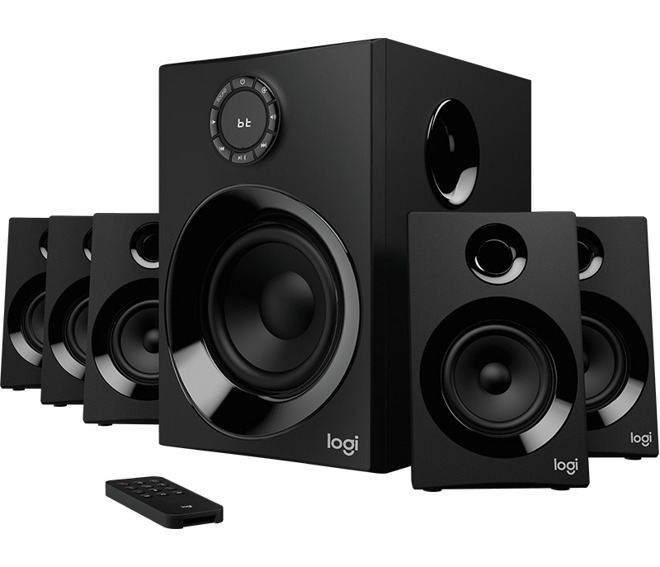 Logitech's Z606 5.1 surround sound speaker system is available for pre-order from Logitech directly, as well as Amazon.com. Priced at $129.99, both retailers are including free shipping on the speakers as well.